Search giant looking for Beta testers, so sign up today! 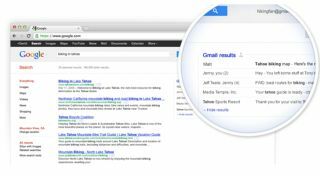 Want Gmail results within your Google searches? Google has announced it is piloting a scheme which would see search queries feature results from your Gmail account. The company is adding a 'mini search engine' to the right of the main results page that will showcase the relevant emails from your inbox or outbox. Google - which is currently seeking a million beta testers - has decent rationale for the move: Sometimes, it says, the information you're looking is right under your nose (presuming you're carrying your email in your mouth). In a blog post, the company said: "Starting today, we're opening up a limited trial where you can sign up to get information from your Gmail right from the search box." "So if you're planning a biking trip to Tahoe, you might see relevant emails from friends about the best bike trails, or great places to eat on the right hand side of the results page. If it looks relevant you can then expand the box to read the emails." The move is another step towards Google linking in all of its services to search. Earlier this year there was controversy over the Search Plus Your World initiative, which prioritised Google+ results over more relevant content from the web. The Gmail search tool does sound relatively useful. However, it would make it doubly important to log-out of your account if other people use your computer. A family member or work colleague making innocent Google searches on your machine could have disastrous consequences if results from your personal email account are showing up all over the place. To sign-up to become one of Google's lab rats for this particular scheme click here.